Size of Male: 30-40 lbs., 17.5-20.5 in. Size of Female: 30-40 lbs., 17.5-20.5 in. 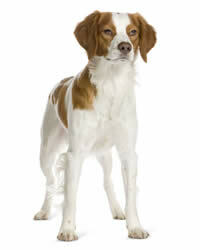 The Brittany dog breed is adept in the hunting field and suitable as a wonderful pet or companion. With its origins as a hunting dog, this breed is relatively easy to train and good natured. This happy dog has an amazing ability to empathize with its owners. A household beset with tension can easily stress out this soft, tailless (or dock-tailed) breed. With the right upbringing and environment, these dogs make wonderful companions for both children and grownups. Named after a French province, the Brittany emerged from a mating experiment between native French spaniels and English pointing dogs. It possessed the English setters’ enhanced hunting prowess. However, it also sported a stubbed tail which was not typical for many pointing dogs back in the mid-19th century. The American Kennel Club officially recognized the breed in 1934 and then decided to omit the label “spaniel” in the early 1980s. The Club’s reason: When you study their hunting style, you’ll notice that it’s more of a setter than a spaniel. Sweet and playful, these dogs get along well with other animals and children. Since they crave for human companionship, it’s not a good idea to leave them alone inside your home for too long. Their active nature may cause them to accidentally bump into kids and furniture. Inadequate or late socialization can cause the dog to fear or shy away from strangers. Either way, you should brace yourself for a tirade of floor mopping. The breed has a habit of dribbling urine when frightened or overly excited. Living Environment – A spacious farm house in the countryside is the ideal setting for this energetic dog breed. These dogs requires a lot of legroom to run freely, but a mid-sized yard will do just fine. This is NOT among the best apartment dogs. Needless to say, a spacious environment is not enough to keep the dog happy. Constant human interaction is necessary as well. Grooming – It may take some effort to maintain their downy coat. Monthly bathing and bi-weekly brushing are suggested to prevent matting and to remove dead hair. If you are planning to show this dog, then some trimming might be needed too. These dogs are seasonal shedders. Diet & Exercise – Feeding shouldn?t be hard. It is more tolerant than English Springer Spaniels in terms of carbohydrate intake. For easier digestion, omit corn, wheat and barley from the dog’s high-protein meal. Recommended protein sources include lamb and poultry. These dogs are hyperactive and they need at least an hour a day to get extremely physical. Vigorous running and outdoor games allow them to showcase their agility and superb hunting skills. You can rarely find a trace of clumsiness in this dog?s moves. Health – In general, the Brittany dog breed is robust. They rank well in the health department. Still, it is a good idea to monitor your pet’s physical well-being. There are a few reported cases of coronary heart disease, epilepsy and lipfold skin infections associated with the breed. A sharp admonishment can easily break the dog’s spirit. This intelligent, sweet-natured breed requires a gentle but firm trainer. For the most part, the Brittany dog breed is eager to please and quite easy to train. They won’t disappoint you when it comes to learning tricks for hunting competitions and canine sports.